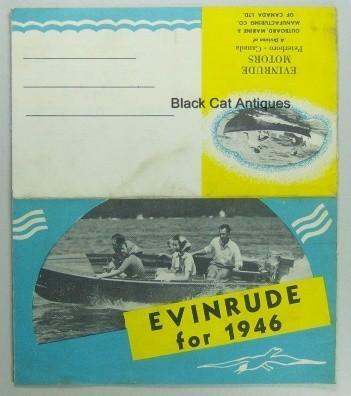 Up for sale, we are offering an original, 1946, Evinrude, Outboard Marine and Manufacturing Co. of Canada Ltd., fold-out sales brochure/booklet. This is a used sales brochure from a local marine and small motor business with valuable outboard information and great vintage photos and illustrations. Condition: This brochure is used and soiled with a small tear on the lower edge, however it is easily readable and useable. Please enlarge the photos to determine the condition of the guide. **Please note: The photos are watermarked with the "Black Cat Antiques" logo, however the logo is superimposed on the photos only and not actually present on the manuals. Size: The guide measures approximately 5.75" wide by 6.5" high - folded and 20" wide by 6.5" high - opened. No. of Pages: One, two-sided page fold-out.